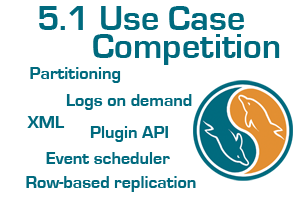 With the GA announcement of MySQL 5.1 coming up, we have picked the winners in the MySQL 5.1 Use Case Competition. 5. Fourat Zouari (TriTUX.com, Tunis, Tunisia): Using Partitioning for Data Warehousing. See Fourat's DevZone article, and his blog entry from May 2008. 6. Ryan Thiessen (Big Fish Games, Seattle, Washington, USA): Logging Game Downloads with Partitioning. See Ryan's DevZone article. 7. Christopher Lavigne (Breadboard BI, Inc., Pleasanton, California, USA): Using MySQL 5.1 for Data Warehousing / Business Intelligence. See Christopher's DevZone article. 8. Jianzy Zhaoyang (Alibaba.com, Hangzhou, Zhejiang Province, China): Using the MySQL 5.1 Event Scheduler for an Online Chat System. When Jian's ongoing migration is done, he has promised a DevZone article. 9. Jakub VrÃƒÂ¡na (phpMinAdmin, Prague, Czech Republic): Managing Events in phpMinAdmin. See Lenz Grimmer's blog entry. 10. Santo Leto (HoneySoftware, Trieste, Italy): 5.1 Use Case Reports. See Santo's blog entries. Thanks an congratulations, Fourat, Ryan, Christopher, Jian, Jakub and Santo! Your MySQL Community Contributor T-shirts are underway.